The Statistics Schedule view shows at a glance various statistics about the weekly schedule and each helper. This view can be filtered by Position and Category to give specific statistics for particular Jobs or Locations and you can turn on and off the various statistics columns using the Change Layout link. This view allows you to quickly see if anyone is scheduled over their maximum hours per week (A.) and also if you have any overnight shifts that could be affecting that number (B.). 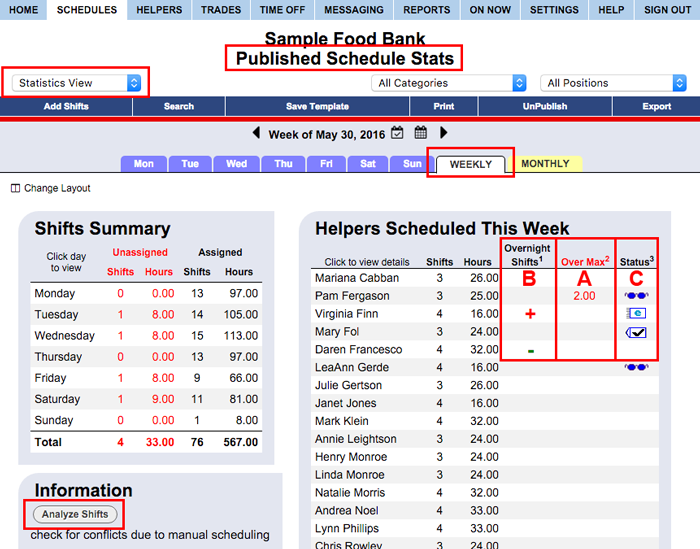 On published weeks, this view shows status icons for whether helpers have viewed, been emailed, or confirmed receipt of their most up to date schedule (C.) To view statistics for a date range, see Custom Reports. 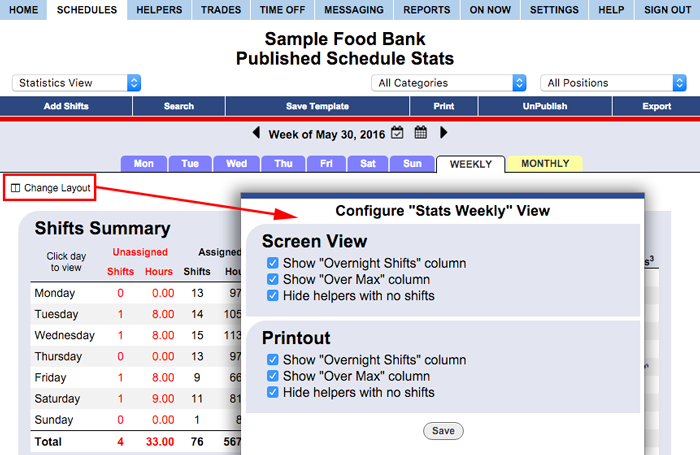 When viewing the current or future weeks, you will see an Analyze Shifts button (D.) which you can click to go to the Sortable list view to see how each shift compares with the assigned helper preferences, maximums, time off, minimum time off between shifts, etc. The Statistics view can be filtered to only show statistics for certain Positions, Position Groups, Categories, Category Groups, etc. Statistics can also be printed and exported for a specific date range (Custom Reports) using the Reports section.